Removing wallpaper may seem like a no-brainer at first, but once you begin, you realize it’s not as simple as you thought. If you have found yourself in this position, B A Madden, a painter and decorator in London, has some tips on howto remove wallpaper from your walls. There are different methods you can use to remove wallpaper. You can peel it off, use a stripping concentrate with hot water, or scrape it off, depending on the type of wallpaper it is. If your wallpaper meets all those requirements, the easiest thing for you to do is probably to paste over your existing paper. One thing to consider before beginning this process is what type of wall you have and what kind of wallpaper you are trying to strip. Most walls are either plaster or sheetrock. If your home is over 50 years old, your wall is most likely plaster. Plaster is more durable than sheetrock. When stripping wall paper from the wall, you don’t have to be too gentle. Sheetrock has been used for the past 50 years. If you have a newer house or it has had a recent remodel, you probably have sheetrock walls. When you knock on the wall, it will sound hollow. 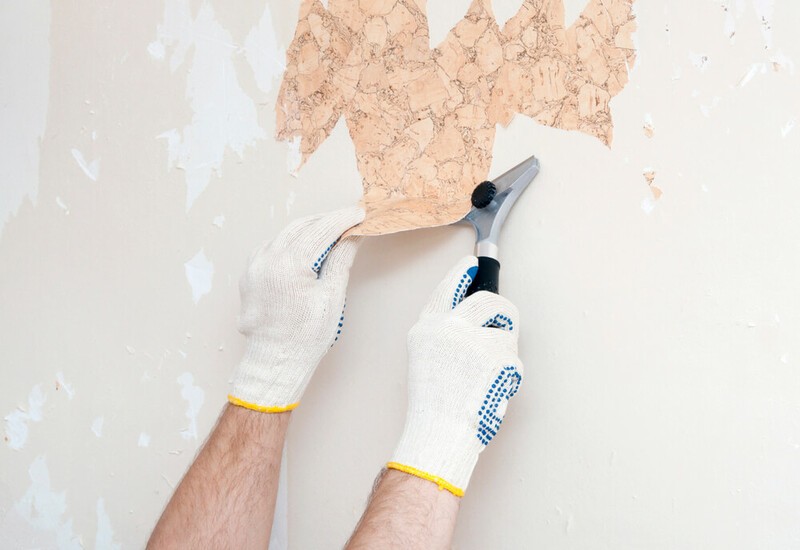 When stripping the wallpaper, you should be gentle with the use of putty knives, scrapers, or any other tool you may use. Sheetrock is easy to damage and nowhere near as sturdy as plaster. The type of wallpaper you have will determine what removal method you use. If you have strippable wallpaper, it will be easier because you can just pull and strip, whereas if you have traditional wallpaper you will go at it another way. No matter which method you use, you will need to begin the same way. Before you begin, remove pictures or décor from walls and any furniture directly under the area you are stripping. Then cover the floor with the large sheet of plastic and tape it to the top of the baseboards. This is to prevent a huge mess that takes hours to clean up as well as keeping surfaces you don’t want wet dry. Instead, when you’re done you can take the tape off the plastic and roll it up and throw it in the trash. Strippable wallpaper (also called temporary wallpaper) makes the whole process a piece of cake. If you are lucky enough that your existing wall paper is strippable, all you need to do is begin peeling away. It should come off in strips effortlessly. Use a 2-inch putty knife to pry the bottom corner of wallpaper away from the wall enough that you can get a good grip on it. Continue pulling the paper slowly, making sure to keep your hand close to the wall while you pull so the paper has less chance of ripping off. Once all the wallpaper is off the wall, you will be left with only the backing. Dip your sponge in your hot water and start at the top, wiping the wall with the water. Let it soak for 15 minutes before you begin scraping it off with your wall taping knife. Scrape in a downward motion so that it falls directly on the plastic. Always follow the directions on how to strip the backing with water. You never want to leave the backing on the wall, no matter how intact it may be. Super convenient and yet extremely difficult to remove, washable wallpaper has a plastic surface, which makes it easy to wipe clean. This same material makes it difficult to remove the wallpaper because it doesn’t allow water (or anything) to penetrate the paper. To overcome this, all you need to do is make slits in the top layer to allow the water to soak into the paper. Spray with water and allow to stand about 10-15 minutes and then use a putty knife to scrape it off. As an alternative, you can also remove the entire top layer by starting at a top corner and pulling it in a downward motion. Once the top layer is removed, you can begin wetting the paper to remove it. The hot water/vinegar method is a popular method used to remove traditional wallpaper. For this, you will need vinegar and hot water in a spray bottle. Spray the paper with your water/vinegar mixture and let it sit for 5-10 minutes. According to Lifehacker, the hot water loosens the glue and the vinegar begins to break down the paper. Once you let it sit 15 minutes, begin scraping it off in a downward motion. There are many options for removing your wallpaper. If you find that one way works better than another way, change the way you are doing it. Stripping your walls of old wallpaper can bring newfound youth to your space. All you need to know is the type of wallpaper on your walls to know exactly how to strip it in the easiest and most proper way.